“This was a really exciting project between the Bangor Wetlands Group at Bangor University and Friends of the Earth. “But none of it would have happened without the efforts of a number of postgraduate students from the university. “The students were instrumental in designing and conducting this entire project – it was a real team effort. “It just shows how good our students are and the types of cutting-edge projects the students at Bangor University get involved in,” Dr Dunn added. Luke FrearsLuke Frears, 22; from Belper, Derbyshire and Jedd Owens analysed all the water samples, filtering them and counting the microplastic particles in the samples for the report, they also demonstrated that using fluorescence during microscope analysis is an efficient way to visually identify microplastics. 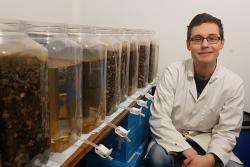 Luke studied his first degree which lead to a Masters in Marine Zoology at Bangor University, and is now studying a Masters Research degree in Biological Sciences specialising in Wetland science. J Jedd Owensedd Godfrey Owens, 23 from Kirkby, Liverpool is currently studying Wetland Science as a Research Masters degree having already gained a Masters degree in Zoology at Bangor University. 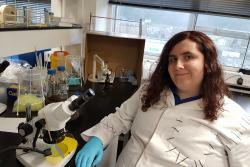 “I was caught quite off guard by how quickly the media began circulating news of our research, it felt surreal, though I am very thankful this was the case as I believe it is extremely important that the issue of microplastics be put in the spotlight if we’re to begin making attempts to combat the worrying results found. D Dan Albergan Aberg, a 22 year old Masters student from Normanton, Derby was also involved in the research. Dan is researching removing pharmaceutical compounds from water using constructed treatment wetlands. For this study, he collected the samples from Cefni Reservoir on Anglesey. He says: “I really enjoyed working with Jedd and Luke on their research as the methodology they’re to develop for identifying microplastics promises to have a wide impact on the UK with potential to be added as a new requirement in water quality surveys. Dan studied for his BSc Zoology with Conservation degree at Bangor and stayed at the University for his Masters due to the great relationships he has with staff and fellow students as well as the high quality of the University’s research in wetland science. Oliver ArmstrongOliver Armstrong, a 25 year old PhD student from Mold in Flintshire assisted with the analysis. He used specialist Raman spectroscopy, a technique used for characterising metallic nanoparticles, to quantify exactly what types of microplastics the team had been finding in freshwater sources. 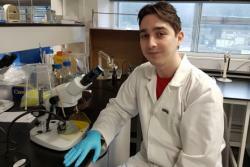 He’s been at Bangor throughout his studies, right through from undergraduate Chemistry, MSc Nanotechnology and Microfabrication in the School of Computer Sciences & Electronic Engineering and then back to Chemistry.